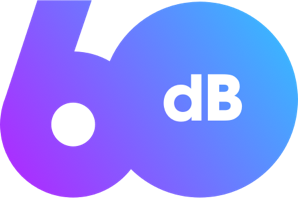 When we started 60dB last year, we set out with the lofty goal of building the best on-demand listening experience for news, sports, and other spoken-word audio. A highly personalized product that features the wide variety of audio that listeners expect, and is available in all of the places they want to listen. A product that supplants the daily habit of radio. Six months ago, we made 60dB available to the public. While it was a great first step, it was just that: a first step. Over the last few months, we’ve spoken with listeners, pored over data and revisited nearly every aspect of the product experience — from its visual design to the underlying algorithms — all to make it easier for our listeners to quickly get to the right story. Today, we’re releasing an updated version of 60dB that is another step towards delivering on the promise of making it easier and more convenient to listen to news, sports and other talk content on-demand. This update is available for iOS via the App Store, and for Android via our new beta app on the Google Play Store. You can also access 60dB via our Alexa Skill or at 60dB.co on the web. The new 60dB home with playlists and new episodes from shows a listener follows; a playlist view and the updated player card. We built 60dB around listening, not hunting for something to listen to. In the new design, personalized playlists are front-and-center. Like the most popular programs on radio today, these playlists feature timely, shorter stories. Unlike radio, we deliver these stories on-demand and tailored to each listener’s unique interests. Now, listening to a playlist or the latest episode from a show you love is only a tap away. We have conviction that bringing more short, timely stories into the digital audio ecosystem will be an important part of growing the audience engaged with on-demand digital audio. 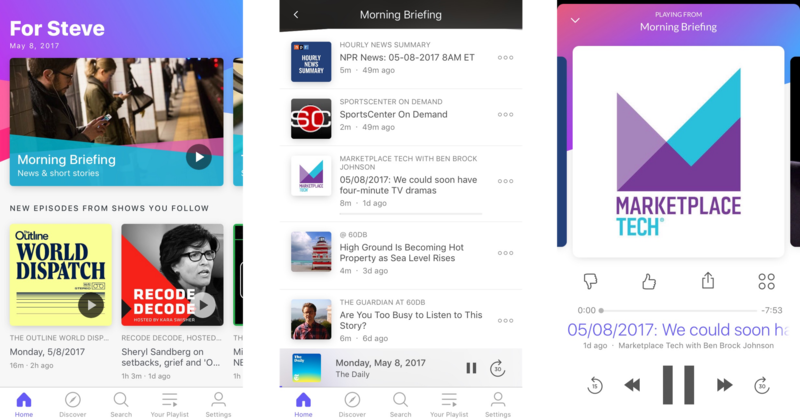 The success of shows like “The Daily” from The New York Times, “Up First” from NPR & “The Outline World Dispatch” demonstrates that there’s tremendous consumer demand for shorter, daily audio. As more producers embrace the type of audio that consumers primarily listen to on the radio, more of those consumers will make the jump to listening through on-demand digital services. We are still in the early days of digital audio. There’s a huge shortfall between the number of people interested in on-demand, spoken-word audio and the number of people who are actively listening. Edison Research’s Infinite Dial report shows that while 60% of Americans (~168 million people) are aware of podcasts, only 15% report listening to one in the last week. Over the last decade, streaming music services have taken off. 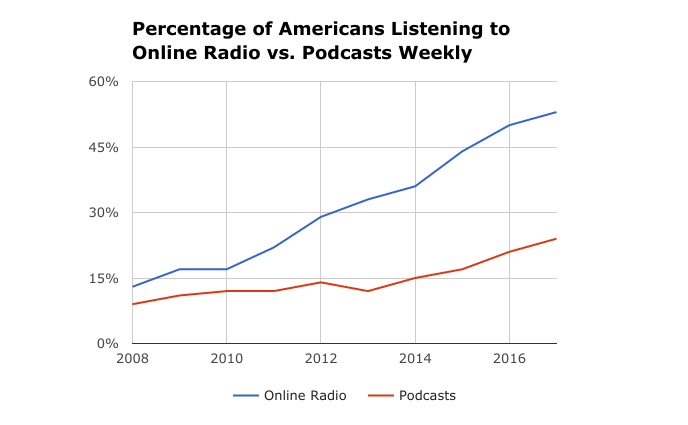 Today, more than half of Americans listen to online radio weekly, while less than a quarter of them listen to podcasts. Our team wants to close that gap by making a product for the more than 120 million people who are aware of — but are not yet listening to — podcasts, as well as those who listen to them regularly. And a product that offers an on-demand alternative for the 93% who still tune into broadcast radio each week. We’re incredibly excited to make this update available. We feel like we’ve taken a big step forward, thanks in large part to your feedback. But we’re equally aware we have a long way to go, and are working every day to make 60dB better for you. We’d love to hear what you think about the new 60dB. Please drop us a line at feedback@60dB.co to let us know what you think.